AC Models from New Zealand has a wide range of resin figures in 1/35 and 1/24 scales, 54 and 75 mm. Owner and sculptor of the company Andy Cairns really sculpted rare subjects on 2016 like African Pickup Crew, Vietnam ANZAC M113 Crew, Chadian Pickup Crew, Mideast Technical Crew and more. One of the latest products is ACM-75025 Turkish Maxim Crew depicting an Ottoman Army Maxim machine gun three-men crew in Gallipoli 1915. Maschinengewehr 08, or MG 08, was German Army's standard machine gun in World War I as an adaptation of Hiram S. Maxim's original 1884 Maxim gun. It was operated on the basis of short barrel recoil and a toggle lock. Once cocked and fired, it would continue firing rounds until the trigger was released or until all available ammunition was expended. Its practical range was estimated at 2,000 metres up to an extreme range of 3,600 metres. The MG 08 was mounted on a sled mount that was ferried between locations either on carts or else carried above men's shoulders in the manner of a stretcher. Germans initially supplied M08 and commercial/export version M09 Maxims to their Turkish allies in World War I. As the war progressed, only the MG08 remained in production, and thus only this model was available for Ottoman Army. For some reason, Turks did not receive sledmounts of M08 models and had to modify M09 tripods as the receiver heights of the MG08 and M09 was different. They also mounted German-supplied MG08's on captured British Vickers tripods. Kit comes in a big white cardboard box labeled with a photo of the assembled kit content. Figures and machine gun parts are seperately inserted transparent zip-lock bags and vignette base is placed under these bags. Parts are cast in light grey resin and served with casting blocks. Resin quality is good. There is a need to clean some flesh resin and seamlines on the parts but details are crisp and clean. Kit includes three figures, parts to make a machine gun and its tripod mount, some field gear like bayonet, binoculars, empty ammo belts and a vignette base. Figures depicting a MG crew in gun position are sculpted in 75 mm size and come with pins on the heads and shoulders to make assembly easier and correct fit with the holes on the necks and shoulders. There are also small blocks under the feet of the figures to place them to the holes on the vignette base. Each figure consists of 4 parts; head, body and two arms or hands. I named the figures as A-Gunner, B-Loader and C-Commander. Heads ; Facial details are well defined for a young soldier on Figure-A and elder soldiers for B and C with moustache. Two of them wear Kabalak, also known as Enverieh, Ottoman sun helmet made of a cane wood frame with two cloth parts wrapped around it. 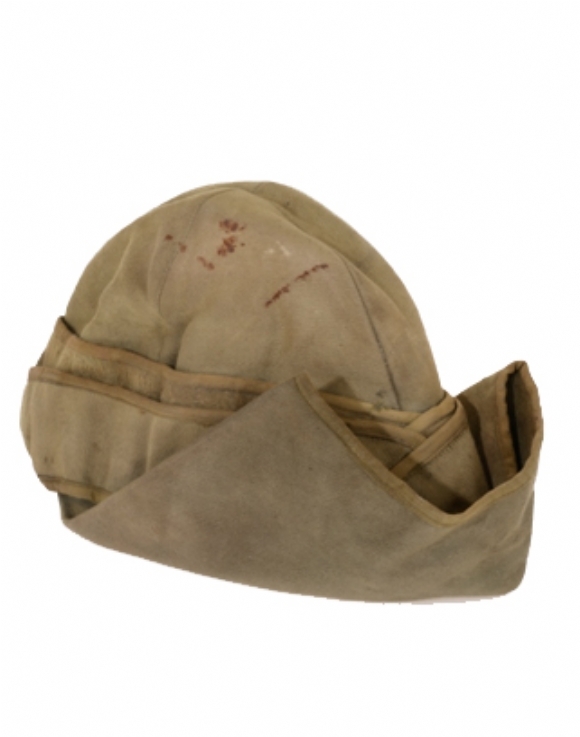 Commander has a Kalpak, a high crowned cap worn by Ottoman Army officers. Bodies ; Figure-A is posed to sit on the ground to operate the machine gun as Figure-B is on his right knee to load ammo and commander on his left knee ready to give a fire command with his left arm. All figures wear brown-khaki color Ottoman Army field uniform made of open-front tunic with two flap pockets on waist and shoulder boards, loosy trousers, khaki cloth leggings and ankle- high laced boots. Officer has knee-length leather boots and a pistol holster on the left side. Uniform details, cloth folds and wrinkles are well defined on all figures. Arms ; They are posed proper for their position like gunner pulling bolt handle, loader holding ammo belt and commander observing with left arm raised to give fire command. Maxim gun parts and accessories come as sixteen parts cast on eight sprues. Parts are quiet clean, details are well defined but they need some cleanwork and extra care to remove as some of them are fragile parts. There is no instruction sheet or explanation to assembly the machine gun other than the boxart photo. I think this assembly can be hard for some modelers and it would be helpful to provide a guide for this process. To make it easier; I added this photo and a drawing on the right column. Other parts are ; an ammo belt that will be assembled between right loader’s hand and MG feed box/receiver, an Ottoman Army Mauser bayonet, an empty ammo belt and a binoculars to display on the ground. Two metal wires are given inside the kit. Thick one can be used as water tube and gun mount handle as thin one for bucket bail. A vignette base in 7x9 cm. dimensions representing a machine gun position is supplied in the kit. Trail/rear leg of the tripod is cast on the base and surface is covered with sandbags, empty ammo belts an empty cartridges. Ground texture, cartidges and cloth texture on sandbags are well defined. I believe this is a unique kit for World War I and Gallipoli enthusiasts. Special thanks to Andy Cairns for the review sample. Highs: Rare subject, nice sculpt, well detailed Maxim gun, very well detailed figure base with empty cartridges and ammo links. Lows: Maxim with many parts can be hard to assemble for some modelers, any guide other than the boxart like a drawing could be helpful. Verdict: Absolutely a great kit to build for Gallipoli Modelers. Personally I am very happy to see the first high quality 75 mm Turkish soldiers besides many WW I German,British and ANZAC figures. Our Thanks to AC Models! Thanks for the excellent review, I realize the time and research it took to put such a thorough review together. I always enjoy reading your reviews on items. As far as the subject, the sculpting looks excellent and will be something I will add to my WWI collection. Have you had a chance to build this kit yourself? An interesting little model. Some forget the role that Turkey played during the First World war as the Western Front tended to overshadow the Dardanelles and Mesopotamia (my great grandad served in Mesopotamia with the South Wales Borderers as well as on the Western Front). Looks to be a nice standalone piece or if further figures are available a mini dio? I particularly like the pile of spent brass and empty belts. Very thoughtful as the belts would be near enough impossible to replicate.